We're starting our trip along Claude Monet's stretch of the Seine River. The Seine starts near Dijon and passes through Paris before gently proceeding to its mouth at Le Havre at La Manche or what the English call the English Channel. It drops only 24 meters over its last 446 kilometres, keeping the current slow. This gentle drop makes the river curve through several large loops or what the French call boucles or méandres. Ocean-going ships go as far upstream as Rouen, and commercial barges continue upstream through Paris into Burgundy. Let's look at a small sample of a higher quality map. 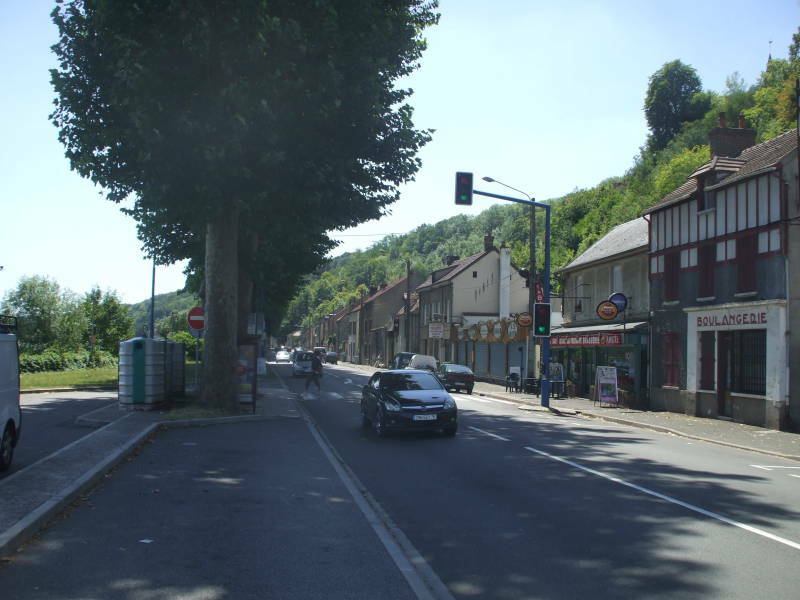 We will start in Rolleboise, where someone in a hurry could quickly cut across the loop through Bonnières and continue toward Rouen. 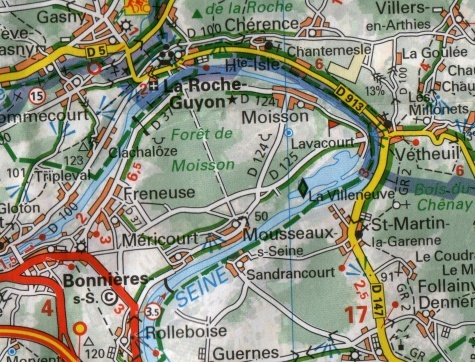 We will instead follow the Seine along small side roads through Mericourt and Mousseaux-sur-Seine to Lavacourt. 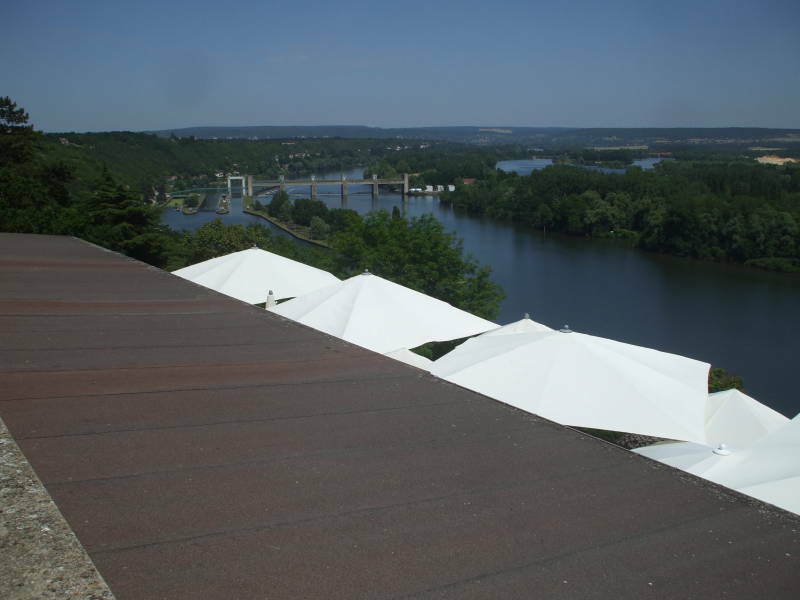 Then we will cross the river to Vétheuil, where Monet lived for several years. There's no bridge or ferry. We will just have to imagine that we took a rowboat as Monet would have when going to the mid-river island or across to Lavacourt to paint the river and the town of Vétheuil. 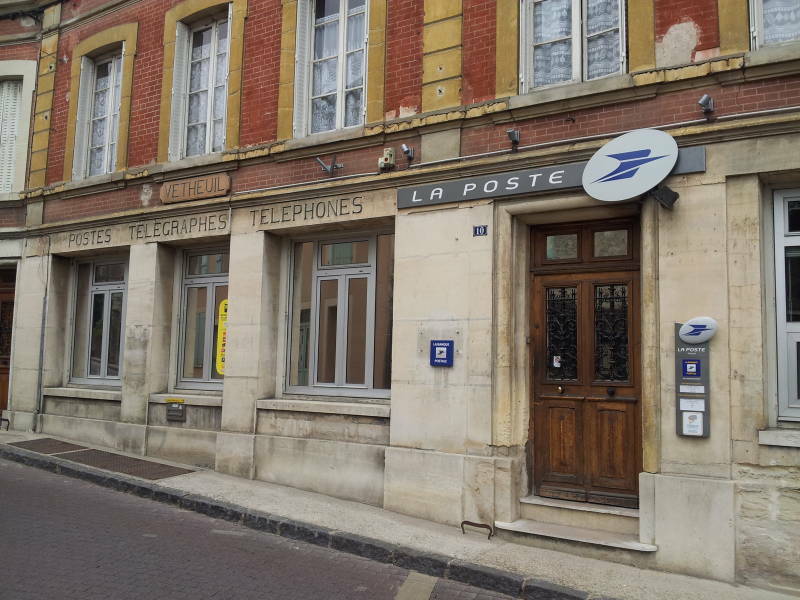 Rolleboise is a town of about 400 people just ten kilometres west of Mantes-la-Jolie. 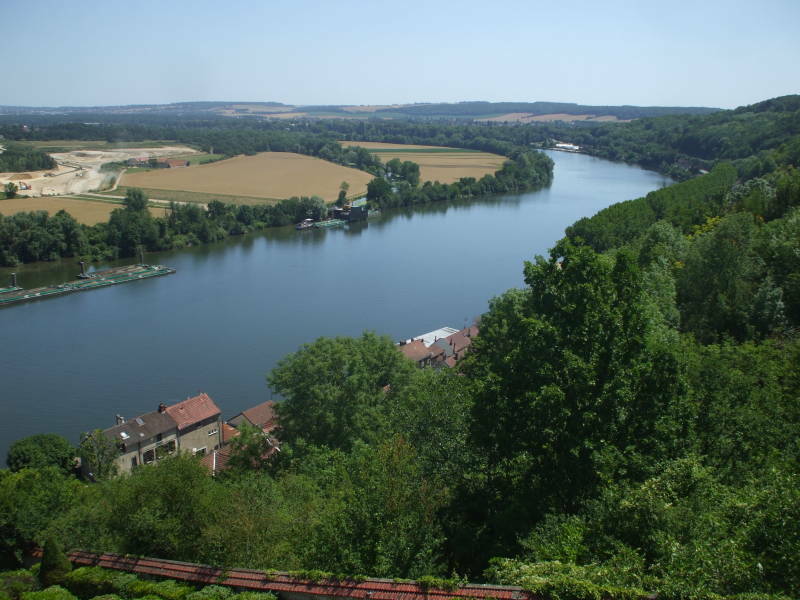 It is spread across an elevation range of 100 metres, from the low part along the old national road 13 and the Seine to the highest point. Here we see the smaller riverside road split off the highway where it begins to climb the bank. The site of Rolleboise has been inhabited since the Paleolithic. A large collection of Moustérian style knapped flint indicates an active settlement and tool industry in the middle Paleolithic. The technology was used by both Neanderthals and anatomically modern humans from about 300,000 to 30,000 years ago. We will see plentiful flint embedded in the chalk bluffs at Haute-Isle and La Roche-Guyon. The Belgic Veliocasses (or Velocasses) tribes controlled the area before the Romans arrived. The settlement was referred to as Rolanis Busius in the 7th century, and as Rosbacium in 751 AD. Sitting right on the river, it was damaged or destroyed multiple times by the Norman invasions, especially in 861. A castle here was captured and occupied by English forces in October 1363, during the Hundred Years' War. 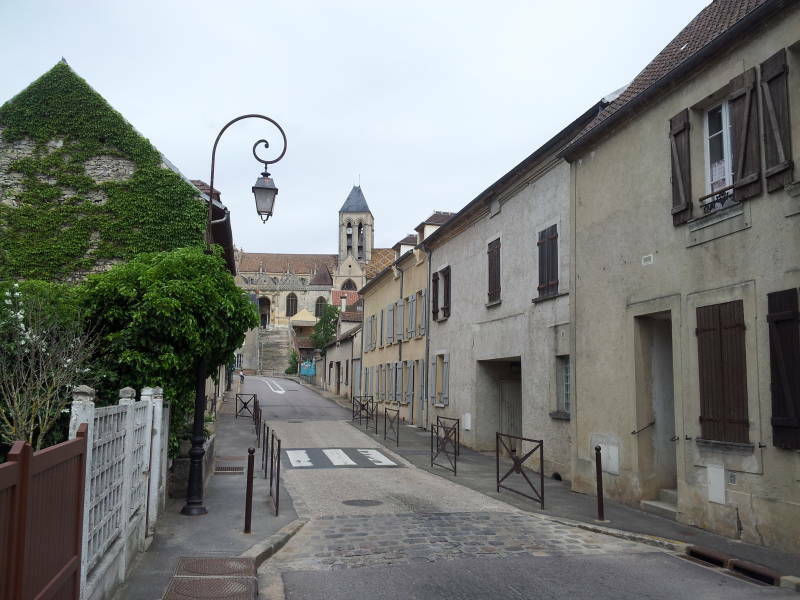 It was called Roilleboise in the 13th century and Rolleboise starting in the 17th century. The Allies landed on the Normandy beaches around Caen and further west on 6 June 1944 in Operation OVERLORD. They moved inland and pivoted toward the east. The goal was to cross the Seine within 90 days after D-Day. 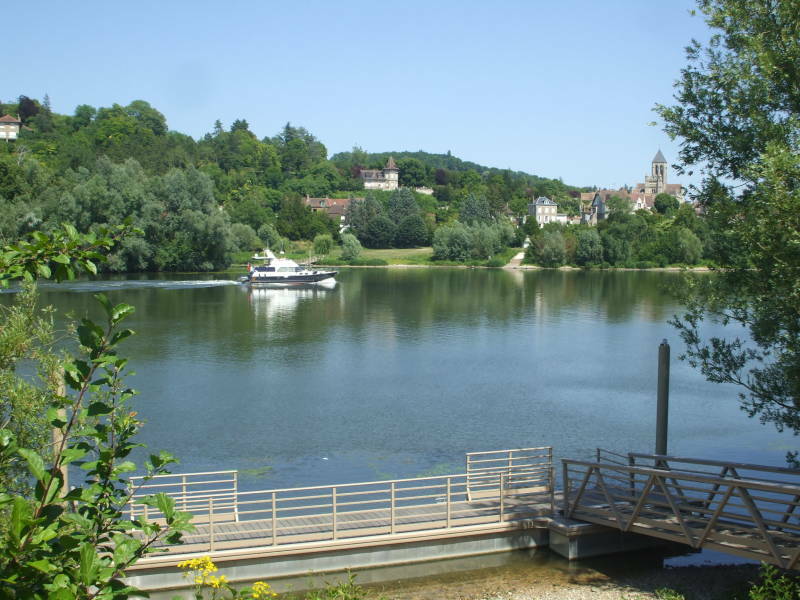 American troops crossed the Seine here at Rolleboise on 20 August 1944, just 75 days after the landings. This marker at the center of the lower town commemorates the crossing. The day before, the bridge at Mantes had been seized by General Patton's 3rd Army. The Allies had anticipated an assault crossing, but that wasn't needed as the German defenses in this part of France had crumbled by early September. 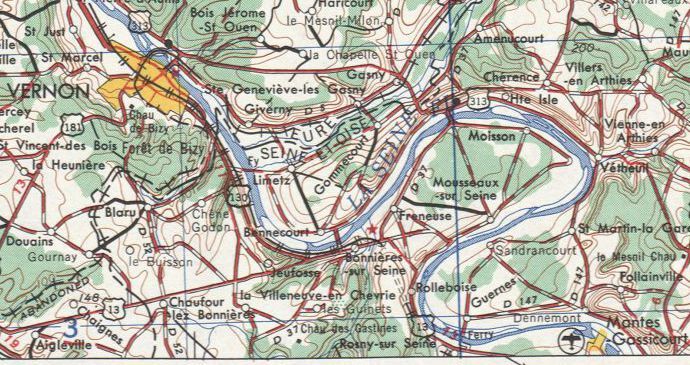 The Canadian First Army did encounter resistance in the area, and there was significant fighting in the Forêt de la Londe near Rouen as the Allies tried to cut off the path being used by parts of the German 7th Army to escape eastward across the river. 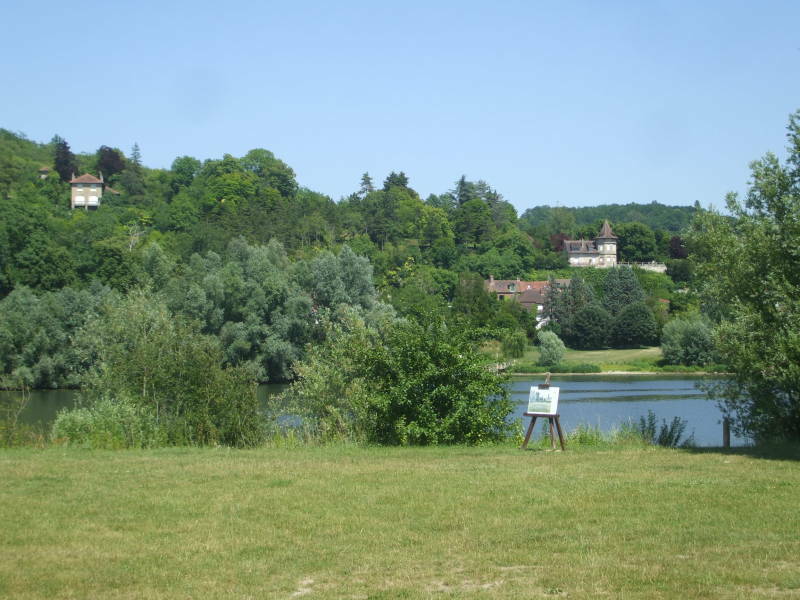 The Domaine de la Corniche was built by King Leopold II of Belgium in 1908. The story is that it was a royal love nest for him and his mistress Blanche de Vaughan. It was turned into a hotel in the 1920s, and went through a series of several owners. A Mr Picard turned it into a popular nightclub in the 1970s. He was active in the Paris nightlife and attracted the clientele of fashionable Paris clubs and restaurants. It was close enough to Paris to be easily accessible, but far enough out to be somewhat exotic, making it very popular among the 1970s jet set. This is when it was renamed the "Château de la Corniche". It changed hands most recently in 2004 and now operates as a four-star hotel with a gourmet restaurant, wine bar, and spa. 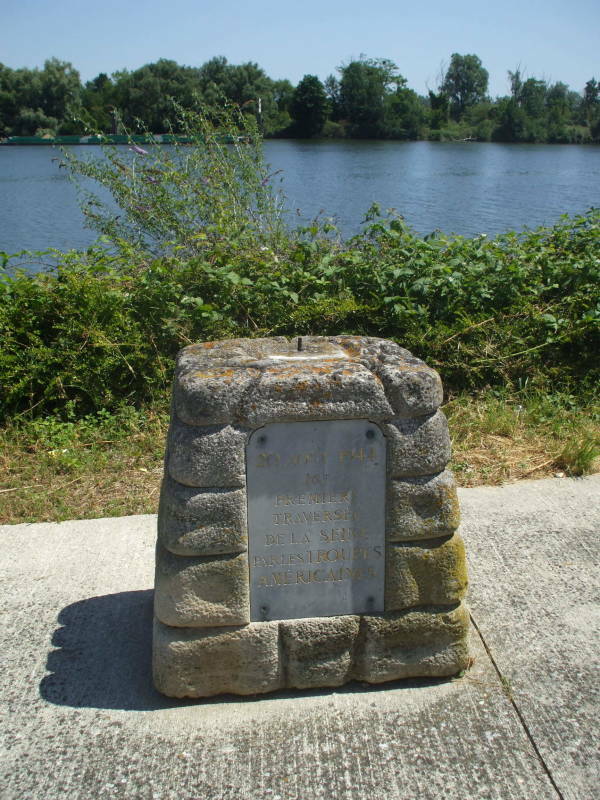 The dam across the Seine just below Rolleboise was first finished in July 1886. It was rebuilt in the 1960s, finished then in 1965. It has two large locks of 160 and 185 meters in length. Along with the locks at Meulan, 27 kilometers upstream, and Port-Villez, 25 kilometers downstream, these locks allow the passage of commercial shipping. Nicasius of Rouen, "the apostle of the Vexin," brought Christianity to the area around 250 AD when he spent one year at Mousseaux. The local people used to live in what they called boves, homes excavated into the soft chalk. Some remain as basements and storerooms. The Saint-Léger church was built from limestone in 1875. It replaced a cave church excavated in 1749, of which only a square bell tower protruded above ground level. 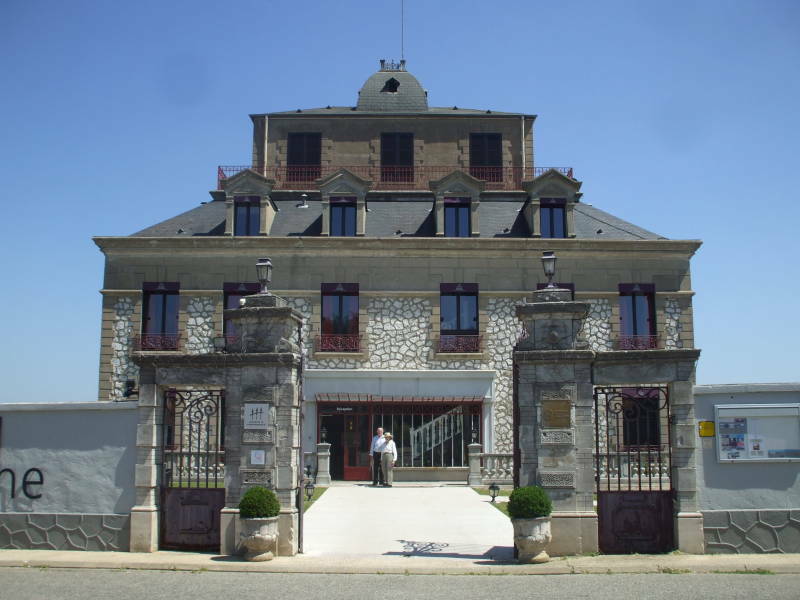 Mousseaux-sur-Seine had a significant wine industry through the late 1700s, and some traces of it still exist. The town now has a population of about 660. 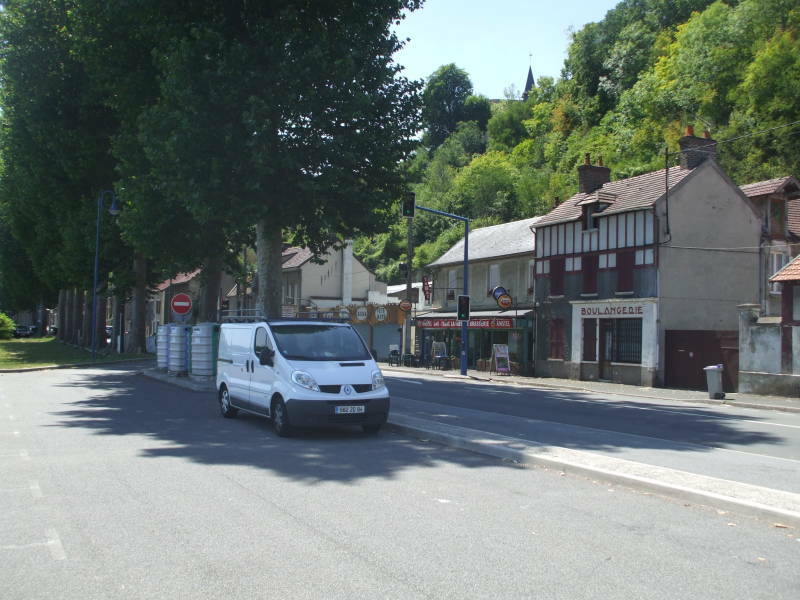 Lavacourt is a small village at the tip of the loop, directly across from Vétheuil. 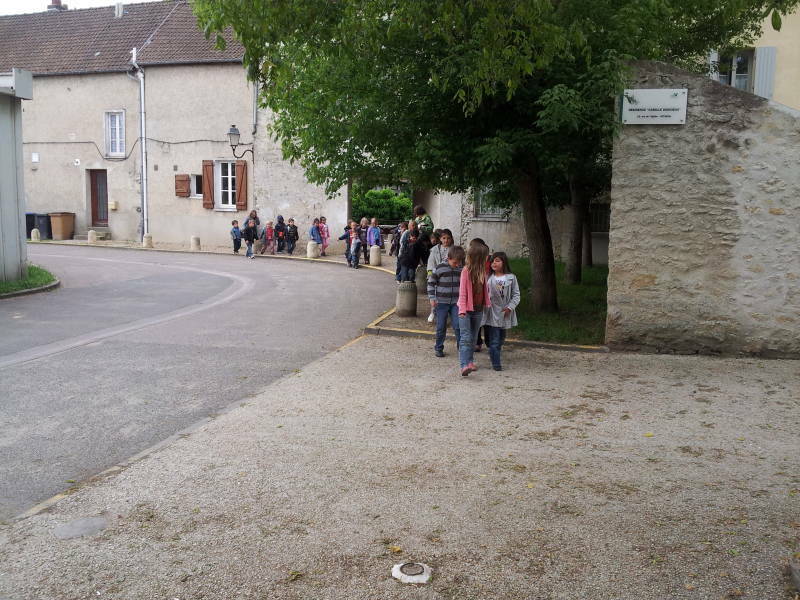 It is administratively part of the community of Moisson, which has a total population around 920. The entire loop is sometimes referred to as Moisson, and the center is now mostly wooded, the Forêt de Moisson. 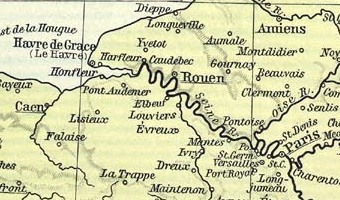 The land within the loop was part of the Duchy of La Roche-Guyon. It was an important rabbit warren until the 17th century. Then the Duke of La Rochefoucauld, the Lord of La Roche-Guyon, granted permission to seven winemakers to hunt all the rabbits, in exchange for 1,200 pounds and twelve dozen rabbits. The following year, a different group of farmers got unlimited rabbit-hunting privileges in exchange for 2,500 pounds and eighteen dozen rabbits. Rabbits breed fast, but that couldn't continue forever. Then in 1750 the Duke Alexander of La Rochefoucauld started a reforestation project, planting oak, birch, and pine. His daughter, the Duchess of Enville, continued the project. In 1773 they planted six hundred feet of rows of mulberry trees, in an attempt to start a silkworm farm. That lasted only a few years. 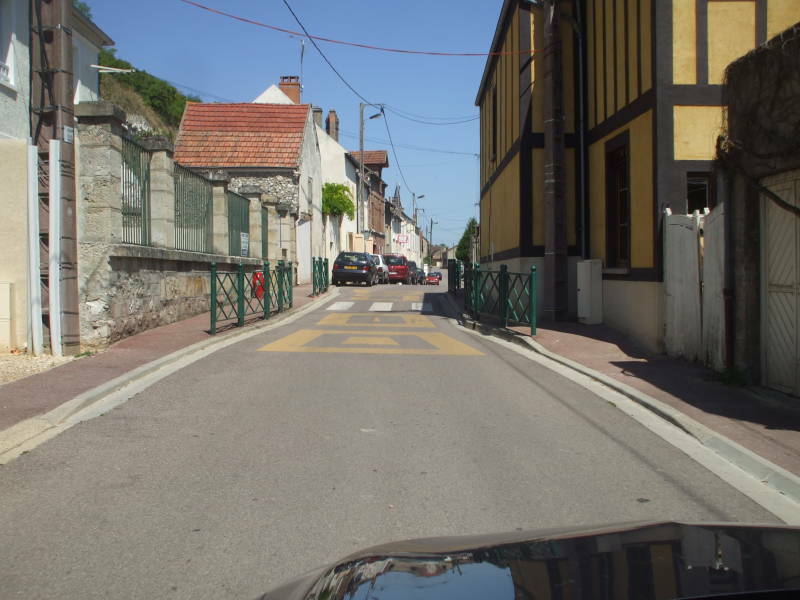 From 1840 to 1940 there was a bridge across the Seine at La Roche-Guyon. Now the loop is very quiet. 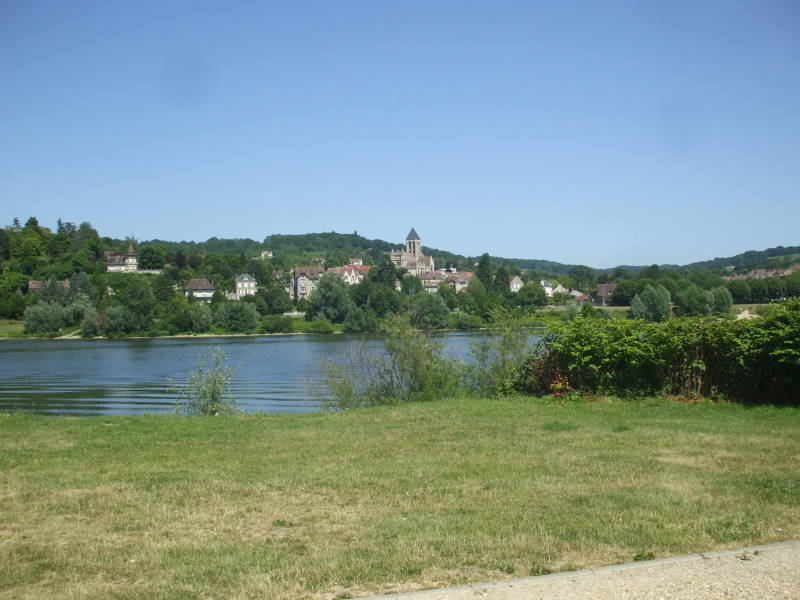 A small park along the river in Lavacourt looks across to Vétheuil. 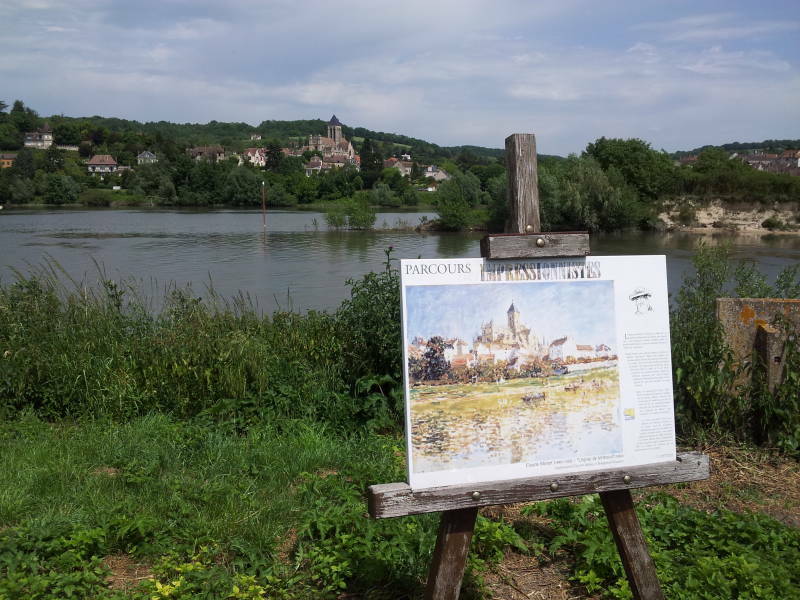 An easel displays a reproduction of one of Claude Monet's paintings of Vétheuil. He made several paintings here and on the small island in the river. 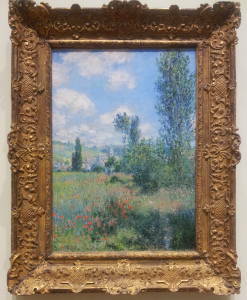 Here are some of Monet's paintings from Vétheiul in museums in New York, Washington, and Chicago. I don't know if Monet assigned any titles to his paintings. I think he simply painted what he saw, and if anyone asked him where the scene was he would explain it. The "titles" are descriptions assigned by museum curators or scholars. 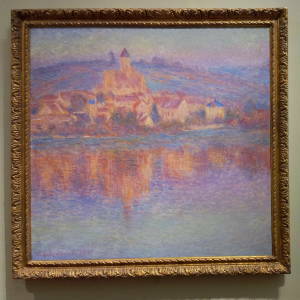 Claude Monet's Vétheuil showing the view from Lavacourt at sunset, one of a series of 13 painted during July 1901, at the Chicago Art Institute. 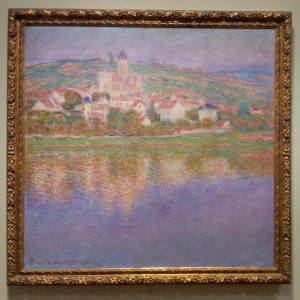 Claude Monet's Vétheuil showing the view from Lavacourt at midday, one of a series of 13 painted during July 1901, at the Chicago Art Institute. 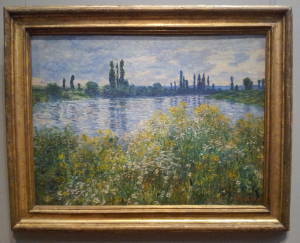 Claude Monet's Vétheuil in Summer (1880) at the Metropolitan Museum of Art in New York. Claude Monet's Banks of the Seine, Vétheuil (1880), showing the view from the mid-river island, at the National Gallery of Art in Washington D.C.
Claude Monet's Île aux Fleurs near Vétheuil (1880) showing the view from the mid-river island, at the Metropolitan Museum of Art in New York. 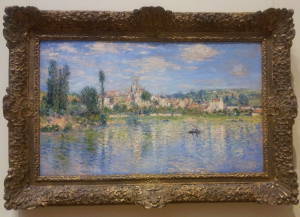 Claude Monet's View of Vétheuil (1880) at the Metropolitan Museum of Art in New York. 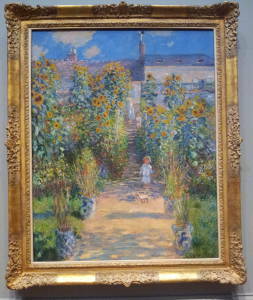 Claude Monet's The Artist's Garden at Vétheuil (1880) at the National Gallery of Art in Washington D.C.
We will cross over to Vétheuil. In Claude Monet's day, you would do this in a rowboat. 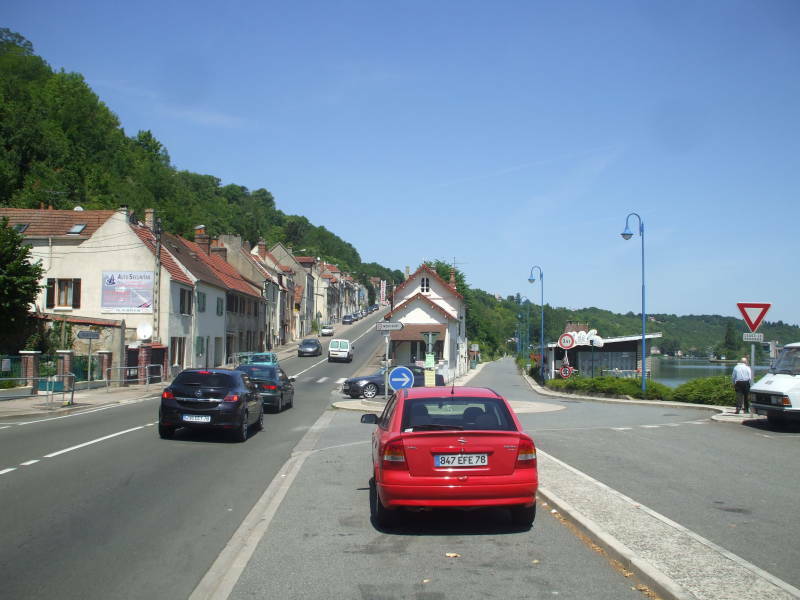 Now there is no ferry or bridge, and the bridge at La Roche-Guyon has been demolished, so you have to drive on around the loop to Bonnières, cross there, and take the D 100 to La Roche-Guyon and continue through there and onto the D 913 to Vétheuil. 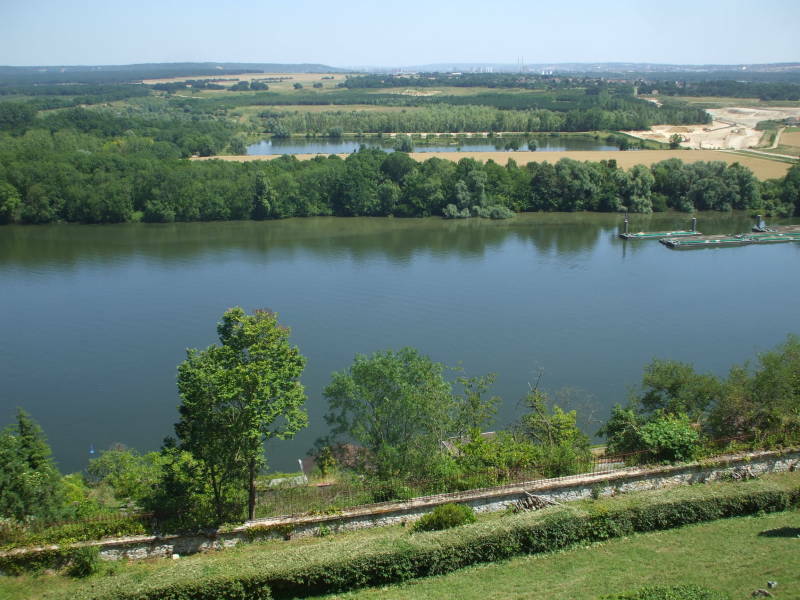 As you approach Vétheuil from the west on the D 913, the ground is sloping from the high ground to your left down to the river at your right. 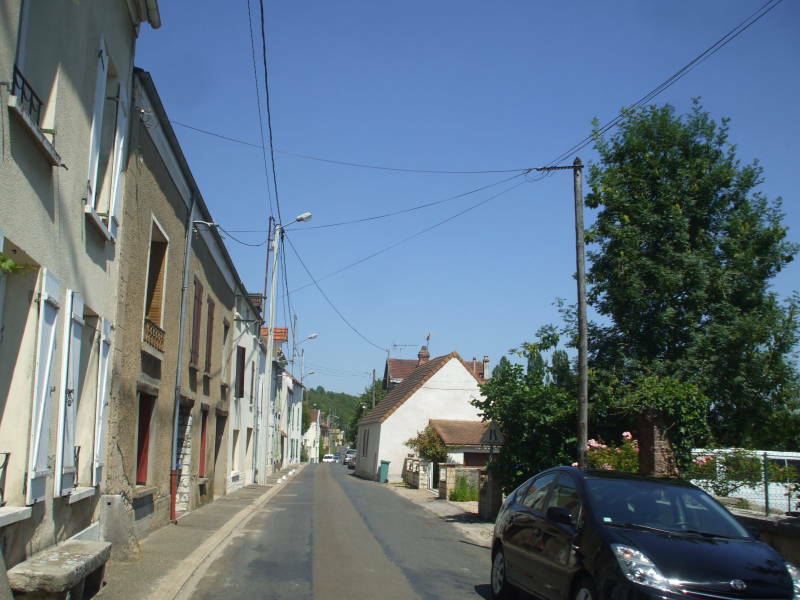 There is a row of houses on your left as you enter the town. 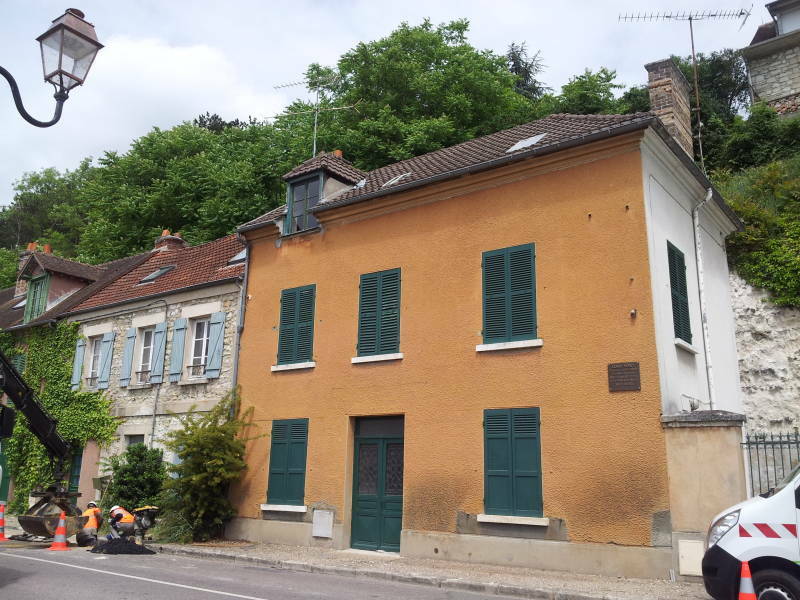 The last of several in a row, the orange-brown one with the green doors and shutters, was Claude Monet's home from the summer of 1878 until 1881. 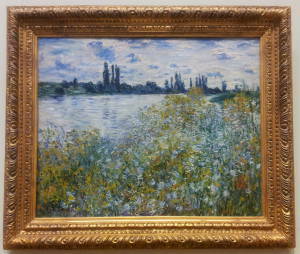 Vétheuil was the subject of about 150 of Monet's paintings. Monet worked quickly. He sometimes took several semi-completed canvases to an observation point, switching between the canvases as the light changed because he wanted to capture one scene in a variety of lighting conditions. With his artwork selling for millions of dollars each today, I have a hard time remembering that he worked so quickly. Vincent van Gogh committed himself to the hospital in St-Rémy-de-Provence for just over a year, from 3 May 1889 through 16 May 1890. During that time he produced about one hundred oil paintings of the hospital and its surroundings, or almost two per week. He produced just over 2100 artworks including about 860 oil paintings in just over a decade. Hardly any were sold during his lifetime, but today they sell for up to tens of millions of dollars. These children are walking to their school, probably coming back from lunch. French school lunch menus are impressive. The meals are very healthy, and the children are taught culture with their meals. 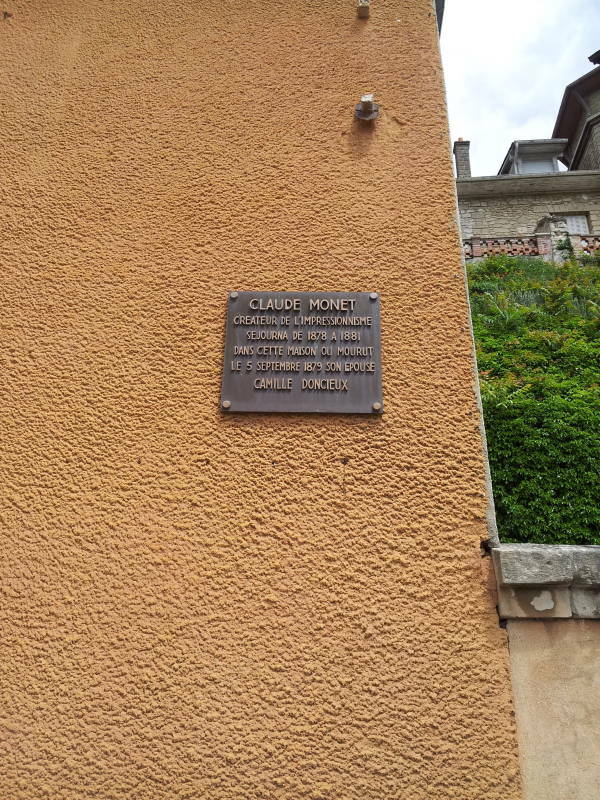 The Vétheuil PTT has been here for a long time! 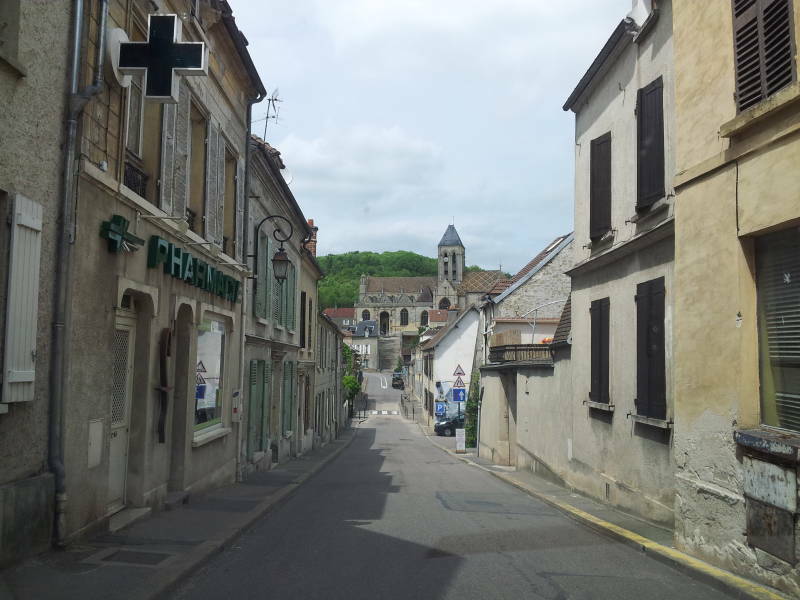 It's quiet at mid-day on a Tuesday in June in Vétheuil. It hasn't always been so quiet, it was a village of some importance in the Middle Ages. 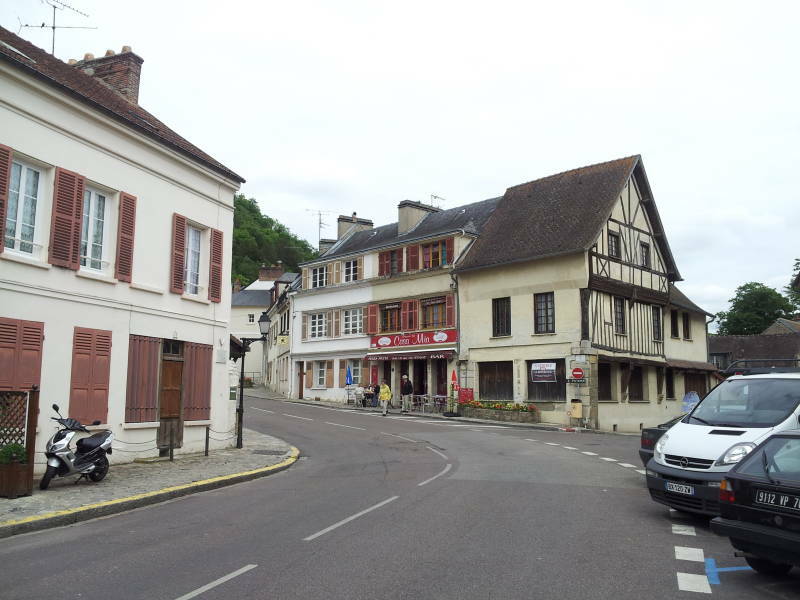 The Normans occupied the village while they were preparing to invade Paris in the 9th century. Viking is the activity of raiding, Norsemen were the people who did it. Those who settled on the coast west of the mouth of the Seine came to be called Normans, from which we got Normandy. The Vétheuil parish church was mentioned in records late in the 11th century, and some remains of a tower from the early 12th century remain within today's church tower. The Mathurins order established a hospital here in 1214. Then a leprosy hospital was established in 1228. The English conquered the village early in the Hundred Years' War (1337-1453). Plague hit the village in 1635. From here we will travel on downstream to the nearby town of Haute-Isle.